After Sally the Seahorse had her 15 minutes of fame on an episode of “unlivable” on the FYI network a few weeks ago, I was inspired to once again dabble with my stash of lake Michigan driftwood. 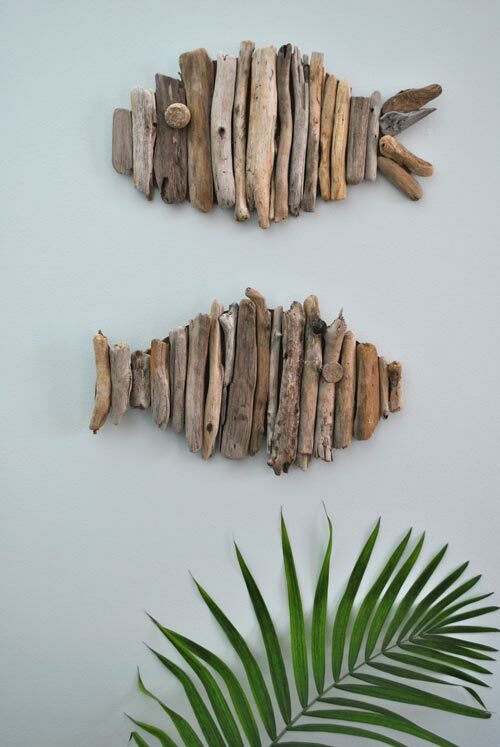 Well actaully that’s incorrect, I have made a pair a sweet pair of driftwood fish … let call them Freddie and Felix. 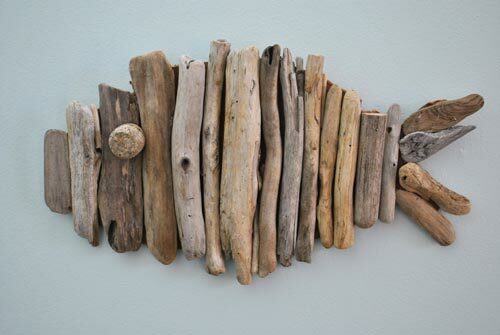 and they are oh-so-easy to make and make a great decorative accent to any beach or coastal themed room. 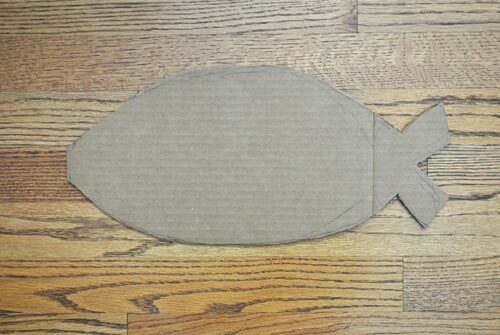 Start by sketching out a general fishy shape on your cardboard. You don’t have to be detailed at all for this. Cut out your shape. 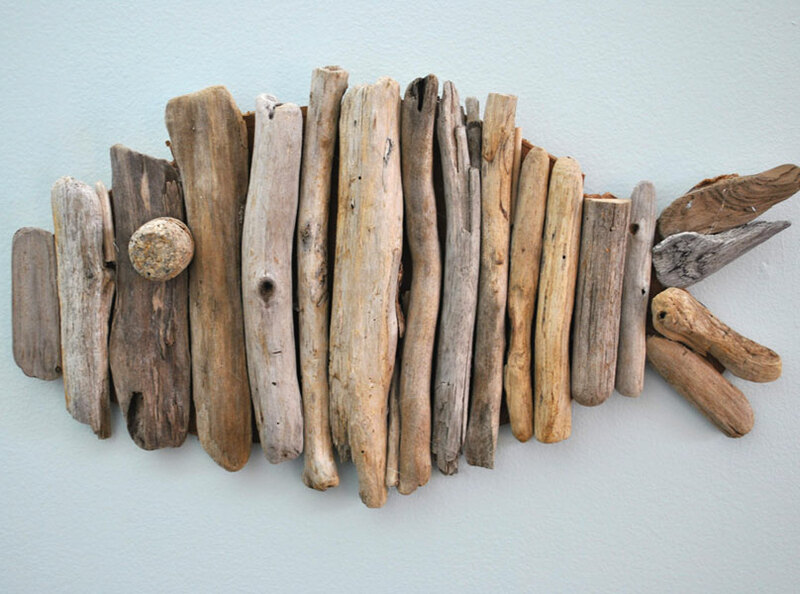 Start laying your driftwood on your fishy shape, it helps if the wood slightly overlaps your shape. Once you are happy with how everything is looking fire up your glue gun and stick away. I added an eye to each of my fish ..it was a old cork I picked up when collecting my driftwood. 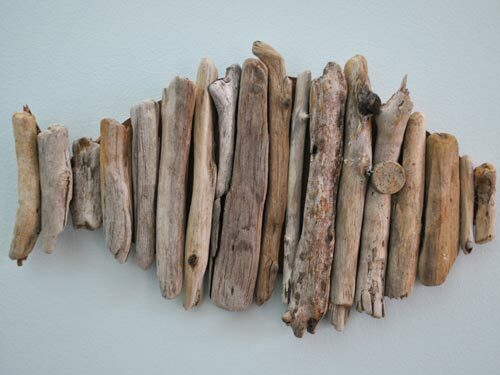 This entry was posted in Art, Coastal Crafts, Coastal Decor, Craft Projects, Decorative Accents, Home Decor, Trash to Treasure, Wood and tagged budget, coastaldecor, driftwood, fish. Bookmark the permalink. These are great. How did you get them to hang on the wall? I adore this fish and the sea dragon too. Moreover, I'm charmed with them. The only thing to buy is a glue gun. 😉 It must be an exciting activity to do with kids. any old sticks would work!